It was a little concerning when the Galaxy S5 GPE never materialized, then the Sony Xperia Z Ultra, GS4, G Pad 8.3, and others were pulled from the store. Meanwhile, no other devices arrived to take their place. The GPE One M8 was priced at $699, which is quite a hefty sum. 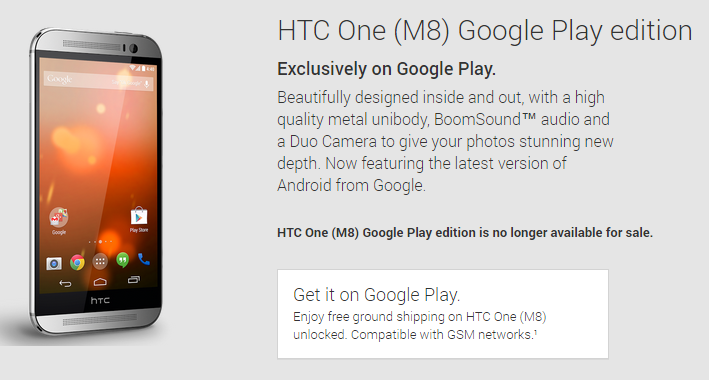 It probably never sold terribly well, and without a larger Google Play Edition program to push, there's little reason to keep it stocked. There's no way to tell if another GPE phone will show up this year, or if we've seen the last of this noble idea. Either way, a moment of silence please.